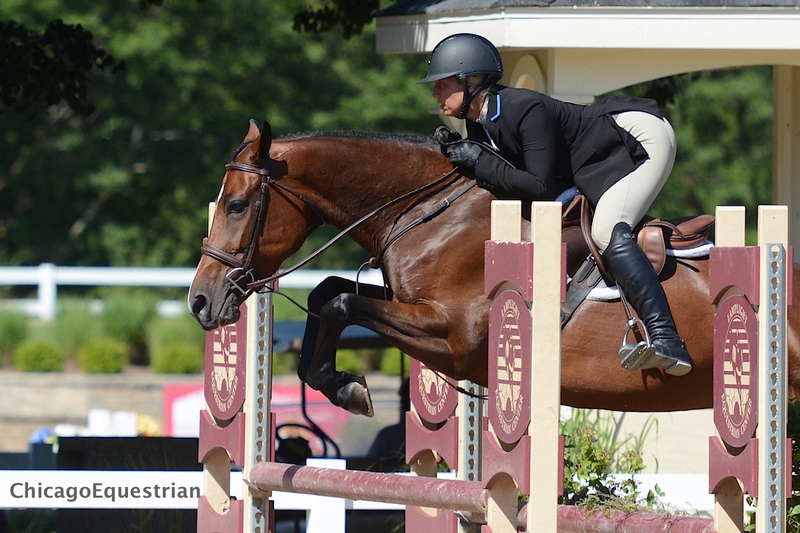 Jennifer Alfano piloted The Exchange to the 3' Pre-Green Championship during WCHR Week. 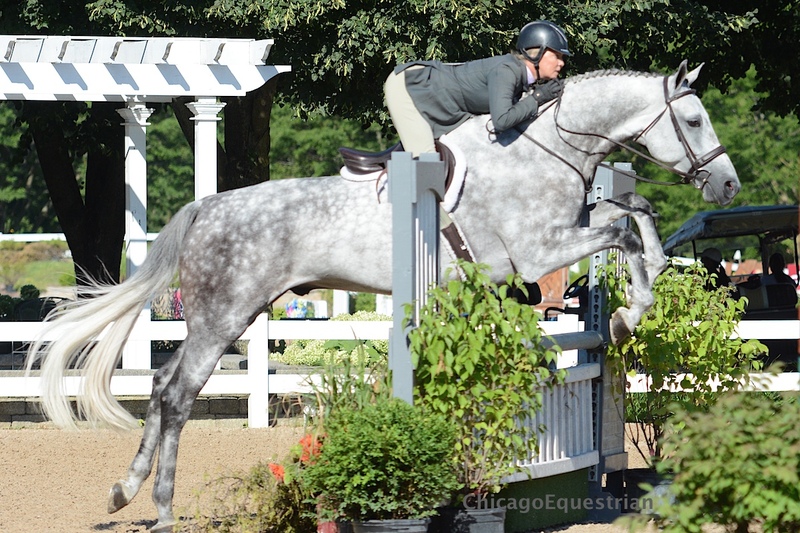 Wayne, IL – July 30, 2015 – Competition continued at Lamplight Equestrian Center during week II of the Equifest two-week series. 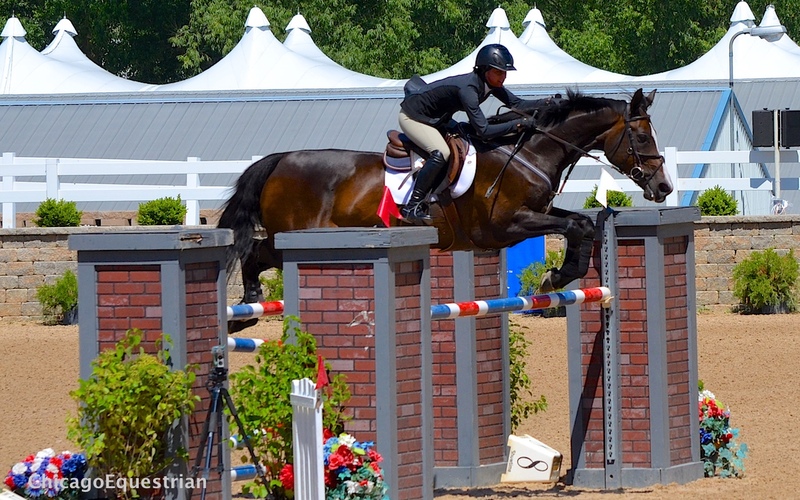 The grand finale of the competition will take place this weekend with the $50,000 Grand Prix and $30,000 Jumper Derby for the jumpers and the $5,000 USHJA National Hunter Derby and $25,000 USHJA International Hunter Derby for hunters. Pre-Green Hunters took the stage today in the Wisconsin Equine Main Hunter Ring, vying for the win in the $1,000 Pre-Green Incentive Stake. Equifest II is a World Championship Hunter Rider (WCHR) recognized event, earning horses and riders points toward the season championships. Castle with Jennifer Alfano in the irons won the 3'3" Pre-Green Hunter Championship and won the $1,000 Pre-Green Incentive Stake. Jennifer Alfano, Buffalo, NY, hit a double header, taking the championship honors in both the 3’3” and 3’ Pre-Green Hunters. Castle, owned by Sharon O’Niell, proudly displayed the tricolor ribbon for the 3’3” section after winning four out of the five classes in the division. Alfano rode The Exchange, owned by SBS Farms, to the top honors in all four over fences classes in the 3’ section for the championship title. Alfano has had much success bringing along young horses and moving them to the hunter derby ranks. Many of her pre-green horses start in the National Hunter Derby and move up to the International Derby when they are ready. 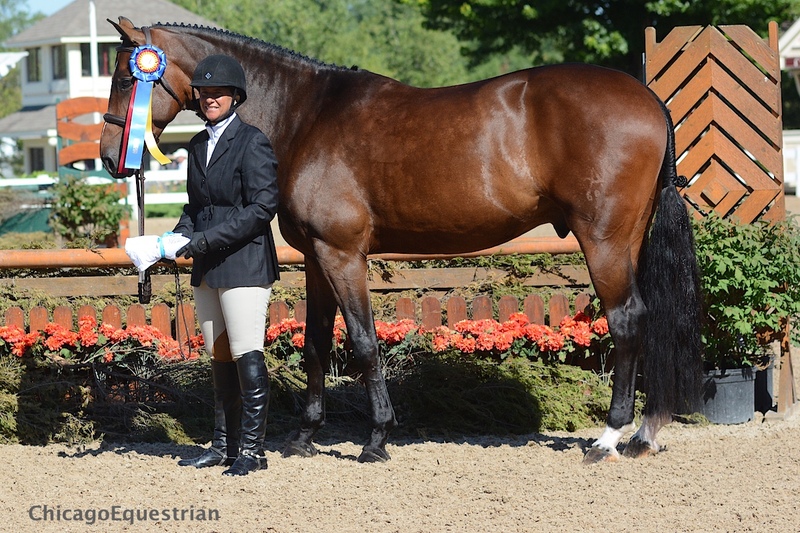 Jersey Boy, three time USEF horse of the year and winner of the 2012 USHJA International Hunter Derby Finals, is just one of those success stories. Alfano works with Susie Schoellkof and SBS Farms. They spend the harsh New York winters in Ocala, FL, with most of the horses getting a month off after indoors before they head to Florida, which includes getting their shoes pulled. Alfano was also recently the barn manager for the George H. Morris Gladstone Program held at Annali-Brookwood Farm in Antioch, IL. Alfano worked with the young riders during the weeklong program, answering their questions on horse care and tuning their horsemanship skills. Among Alfano’s list of credentials, is her hands-on care for her horses, which is top notch. In 1988, Alfano took care of the famous Grand Prix show jumper, Gem Twist, for Greg Best and traveled with them to the Seoul Olympic Games, where Best and Gem won the individual and team silver medals. Tracy Fenney and MTM Personalized took the Reserve Championship in the 3'3" Pre-Green Hunters. A tough act to follow but keeping right up with the pace was Tracy Fenney and MTM Personalized, who took the Reserve Champion ribbon back to Texas in the 3’3” section. Caitlyn Shiels rode Margo Lyon’s Kadence Darco to the Reserve Champion honors in the 3’ section. Kadence Darco and Caitlyn Shiels earned the 3' Pre-Green Reserve Championship. For the $1,000 Pre-Green Incentive Stake class it was Alfano again, taking the top spots with Castle and The Exchange respectively and Fenney right behind with MTM Personalized for third place. 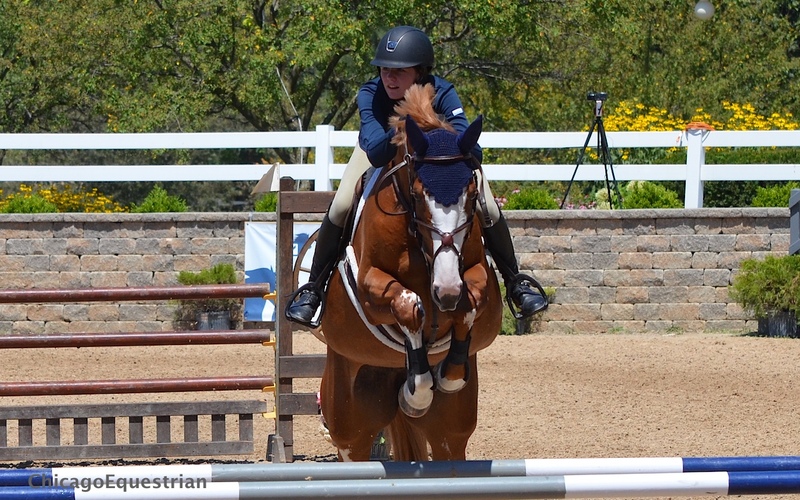 Equitation riders had their chance to perform in the hunter rings today with the Taylor Harris Insurance Services National Children’s Medal, the ASPCA Maclay Horsemanship class and the USEF/Pessoa Hunt Seat Medal. Amy Muslin won the THIS National Children's Medal. Amy Muslin and Rico were the best after the work-off in the THIS Medal. The pair was called back on top before the test and was able to hold the lead for the win. Amanda Shaw won the ASCPC Maclay. 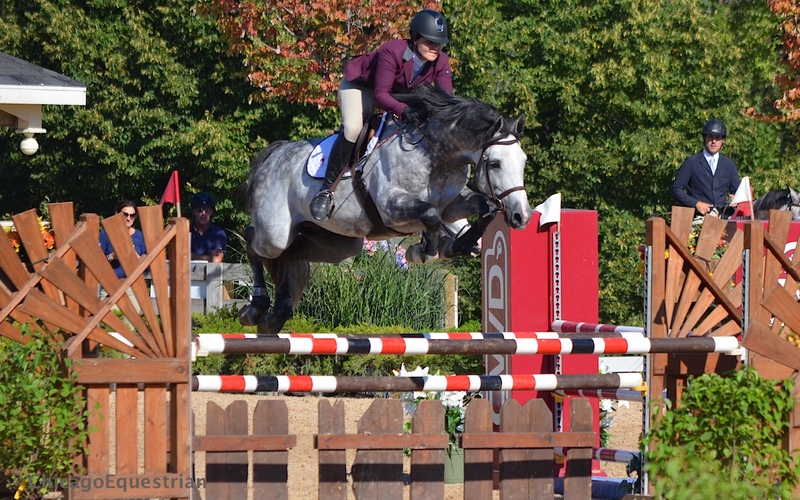 Amanda Shaw, Wildwood, MO, was the best of eight in the ASPCA Maclay. Shaw and her mount, Contemporary put in a smooth and handy round over fences and after demonstrating their flatwork, earned the blue ribbon. 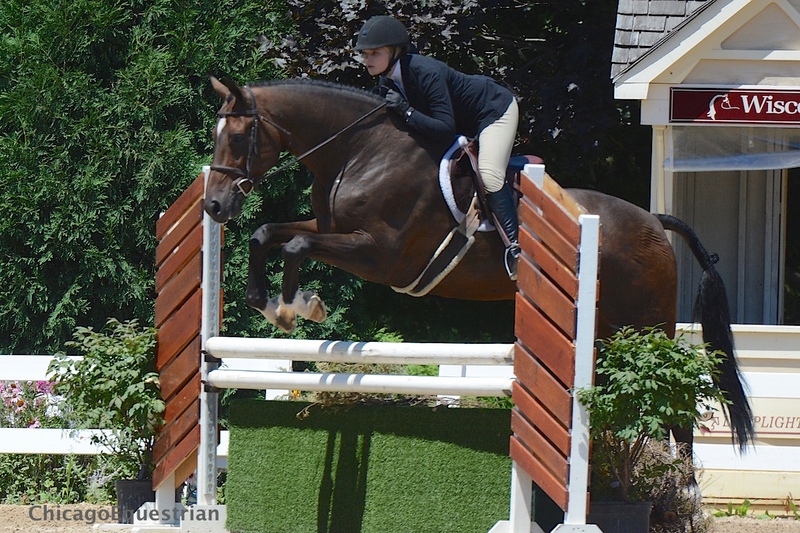 Shaw, 16, has had her horse for about two years and shows in both the junior hunters and the equitation. She describes her horse as ‘calm but a bit particular’ around the barn and says he lets you know how he prefers things to be done. Meghan Peavey won the USEF/Pessoa Medal. Barn-mate Meghan Peavey and Falco were second in the Maclay but took the top place after the work-off in the USEF/Pessoa Medal. Shaw was second and Isabella Baxter and Whenever, were third. Peavey, 17, is from Leawood, KS, and started leasing Falco from Andy Kocher in March. She also shows him in the 3’3” Junior Hunters for more ring time. Shaw, Peavey and Baxter, all ride with trainer Shannon Hicks at Griffin Farms in Wentzville, MO. Hicks travels to Kansas once a month to train Peavey when they’re not on the road. Both Shaw and Peavey are already qualified for their Maclay Regional and will both be going to the Pennsylvania National Horse Show for the Medal Finals. 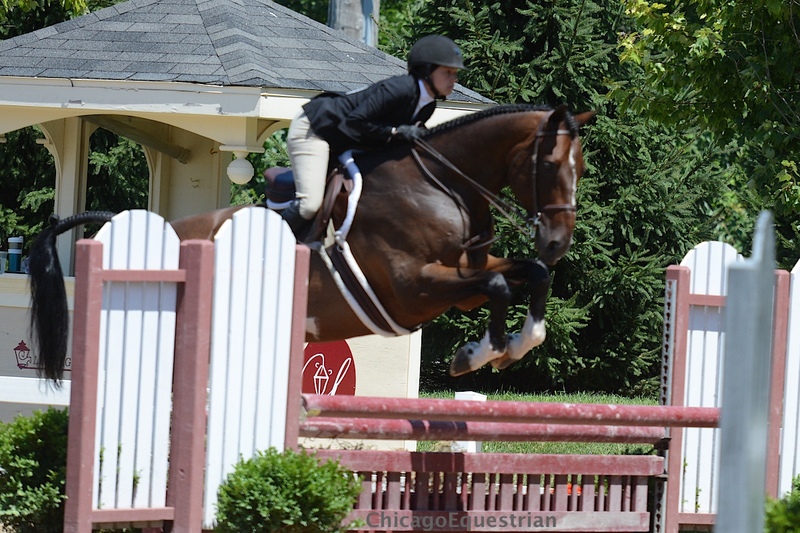 Hunter competition continues Friday with Junior and Amateur Owner Hunters as WCHR week continues, heading toward the grand finale of Derby Day on Sunday. 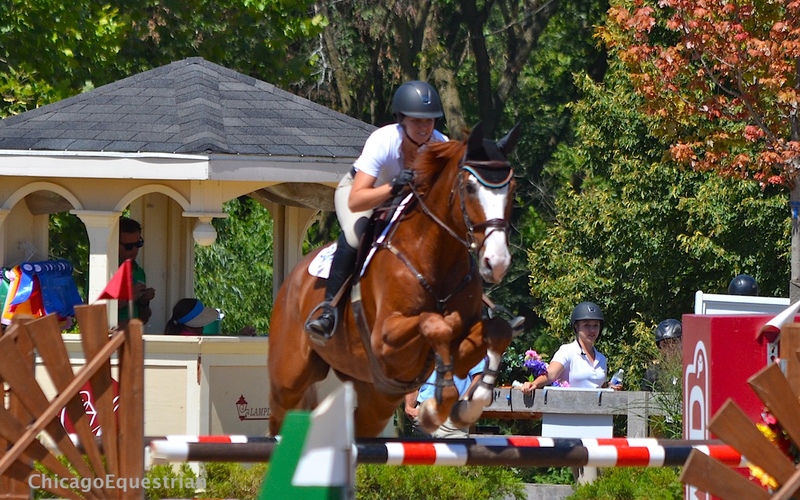 Jumper competition continued with the $1,000 High Junior/Amateur Owner Jumpers. The course proved difficult for the nine riders, with a natural oxer-vertical one stride and seven strides to a brick wall oxer, causing the most trouble. None of the nine were able to deliver a clean round and resulted in a jump off of the four faulters for the eventual winner, Lynsey Whitacre and Barillo W, with Ashley Marshall and Lorde in second. Lynsey Whitacre and Barillo W. Photo Elizabeth Stein. Top course designer Leopoldo Palacious, admitted it was somewhat difficult to design for this particular class. “This is a problem to manage the number of clean when you have only nine riders in one class. When I used the same course for other classes like the professionals, you have clean rounds. I (saw) in the book it was 1.35m so that is what I set,” said Leopoldo. Whitacre, St. Joseph, MO, pulled ahead in the jump-off with a clear ride in 34.540, Marshall unfortunately had one rail and a time of 40.878. Whitacre’s ride, Barillow W, is not a new one for her. She purchased the gelding about three years ago and has been moving up with him consistently since then. The PhD. student had nothing but praise her mount, his character and consistency. “Barillow is a 10-year-old Canadian Sport Horse gelding. He was just kind of coming up in the ranks when I got him and he’s been very consistent the past few years,” said Whitacre, who admitted she has limited time to ride due to her studies. Whitacre, who will be competing in the $7,500 Cavalor Show Jumping Hall of Fame High Junior/Amateur Owner Classic this Saturday, added that it was nice getting a chance to come back and ride the jump-off. “The jumps weren’t huge but the course was pretty technical. It was good to come back and ride the jump-off, which was also pretty technical,” said Whitacre. Caelinn Leahy and Blossom won the Low Junior Amateur jumper class. Photo Elizabeth Stein. 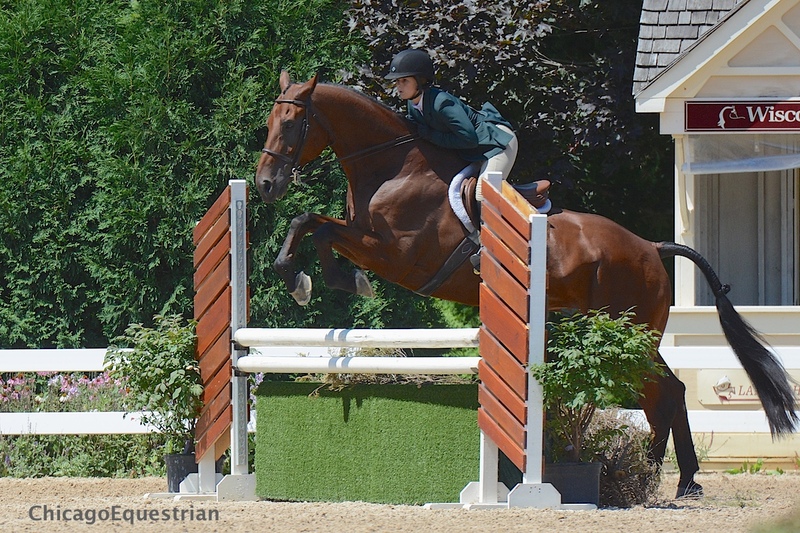 In the Low Junior/Amateur Owner class, Caelinn Leahy took the top honors with a speedy 33.287 double clear round. Leahy, of Maple Park, IL, had the ride aboard Laura Steffee’s Bloesem. “She’s an amazing mare, she has a big floaty stride. She loves to jump and go fast and she can turn on a dime,” said Leahy of her mount. Leahy has had success not only in the Low Junior/Amateurs, but in the Highs as well. Last week in the $7,500 Cavalor SJHOF Classic, Leahy was third aboard Esquilno Bay, a horse she hopes to continue to progress with. “My goal is to move up to Grand Prix’s consistently. I would love to go to the Young Rider Championships and the Olympics one day,” added Leahy. Earlier in the day, Andrew Kocher continued his winning streak with victories in both the 1.25m and the 1.30m. In the 1.25m, Kocher rode Filip, owned by Beth Congel, to the top ribbon and in the 1.30m, he took the victory with his mount, Curiel Boston. Shannon Hicks delivered the only double clear round aboard Carit Dmz, owned by Helen Gilbert, to clinch the victory in the 1.35m jumpers. Taylor Flury and Carrasca Z. In the Five Year Old Young Jumper Champion class that serves as a qualifier for the Young Jumper Championships, Taylor and Alison Flury took the first and second place spots aboard Carrasca Z and Cosmea Z respectively. The Flury’s are the owners and trainers of AliBoo Farm, Minooka, IL, which specializes in the breeding and training of young horses. Jumper competition continues Friday with Children’s and Adult Jumpers. The premium show is a USHJA 2014 Member's Choice Award Winning Horse Show, rated by its members as an exhibitor friendly show and facility. Managed by Allen Rheinheimer, the show offers a $50,000 Grand Prix and a Derby Day during this second week of competition.